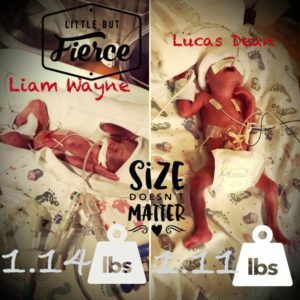 Liam and Lucas surprised mom and dad when they decided to come at just 25 weeks gestation! Liam had a Grade 4 brain bleed and a PDA in his heart that required surgery at the University of Iowa Hospital. Lucas also had a PDA but his doctors felt it would close on its own so he stayed at the NICU in Des Moines at the hospital where they were born. Mom and dad needed a little assistance with travel expenses since they were all over the state for home, work, and 2 different NICUs. Whew!